Pleurothallis Orchids are a large genus, mostly small growing, many with tiny flowers but also very attractive. This is another genus from the forests of the Andes, high humidity but cool temperatures. Pleurothallis marthae pictured is a wonderful example of the tiny flowers in this remarkable species. As a general rule high humidity is one of the key factors, consider at they come from such a climate, so 70% plus is what to aim for. And remember that although they do like humidity they do not like high temperatures, a maximum of 20 – 25C. Conversely no freezing night temperature either. Light should be good but not direct or strong, so filtered. High humidity and good air circulation are essential. So bright filtered ligh, not direct sun. One simple rule is not to let them dry out. As this is wide ranging group of orchids the temperature requirements will differ a little from species to species, however they are a cool growing orchid, rather than tropical. 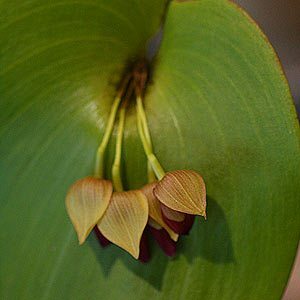 One of the keys to successful cultivation of Pleurothallis Orchids is the growing medium, it is that combination of free draining but moisture retaining growing medium that is essential. In nature many are epiphytic and you could mount them on some tree fern or similar, however providing the required moisture can be difficult so more often they are grown in orchid baskets or pots.